Posted by rogerhollander in Canada, Energy, Environment, First Nations. “We are investigating the likely cause of the occurrence, which we believe to be mechanical,” the company said. “Canadian Natural has existing groundwater monitoring in place and we are undertaking aquatic and sediment sampling to monitor and mitigate any potential impacts. As part of our wildlife mitigation program, wildlife deterrents have been deployed in the area to protect wildlife. Canadian Natural Resources did not respond to the charge that they aren’t disclosing the scope of the spills. Oil companies have said in situ methods are more environmentally friendly than the open-pit mining often associated with the Alberta oil sands, but in situ is more carbon and water-intensive. “In the course of injecting steam they’ve created fractures from the reservoir to the surface that they didn’t expect,” said the scientist, who is speaking out over concern that neither the company nor Alberta’s regulatory bodies would properly address the situation. On Thursday, the Alberta Energy Regulator confirmed there were four spills in the last few months, and ordered Canadian Natural Resources to restrict its steam injections and enhance monitoring at the operations in Cold Lake. Regulator official Bob Curran said the latest spill is spread across 40 hectares. Canadian Natural Resources disputed that figure Friday. “We have the mapped area impacted to be significantly less than 40 hectares with the area being reduced daily through effective cleanup efforts,” the company said. Critics say such spills raise questions about the safety and viability of in situ extraction, which by 2020 is expected to account for as much as 40 per cent of Canada’s oil sands production, because many of Alberta’s deposits cannot be mined. “This is a new kind of oil spill and there is no ‘off button,’ ” said Keith Stewart, an energy analyst with Greenpeace who teaches a course on energy policy and environment at the University of Toronto. “You can’t cap it like a conventional oil well or turn off a valve on a pipeline. “You are pressurizing the oil bed so hard that it’s no wonder that it blows out. This means that the oil will continue to leak until the well is no longer pressurized,” which means the bitumen could be seeping from the ground for months. The Cold Lake operations are on the traditional territory of the Beaver Lake Cree First Nation, which is pursuing a constitutional challenge that argues the cumulative impacts of oil sands industrial development are infringing their treaty rights to hunt, fish and trap. As well, the First Nation says there are graves alongside the lake in the area affected by the spills, and that band members have been unable to access that area. Emma Pullman is a Vancouver-based researcher, writer and campaigner. She is a campaigner with Leadnow.ca and campaigns consultant with SumOfUs.org. Posted by rogerhollander in Canada, Energy, Environment. Environmental groups are hoping to trigger what they call the “largest civil disobedience action in the history of Canada’s climate movement” Monday in Ottawa — a sit-in on Parliament Hill to protest federal government support of Alberta’s oilsands. 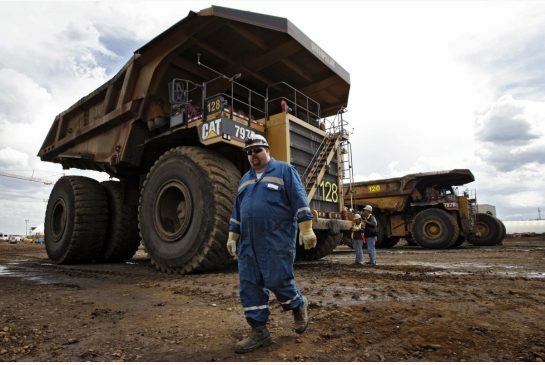 Monday’s action takes aim at Alberta’s oilsands as a whole, but the effort piggybacks on growing American and Canadian attention to the proposed $12-billion Keystone XL pipeline extension. As U.S. lawmakers draw closer to deciding whether to approve the massive project, expected to eventually pump 900,000 barrels of raw bitumen daily from Hardisty, Alta., across nine states to refineries in Texas, the pipeline proposal has become a magnet for wider environmental and economic debate on Alberta’s oilsands production. Where environmental activists weigh in against bolstering fossil fuel development, Canadian unions and even former Alberta premier Peter Lougheed have raised questions about exporting jobs. Across the U.S., meanwhile, local organizations worry about backyard environmental issues — including worst-case scenarios for the pipeline’s impact on the Ogallala Aquifer in Nebraska. “It’s been an interesting year, and yeah, it’s been challenging,” said Shawn Howard, a spokesman for TransCanada, the Calgary-based company building the pipeline. 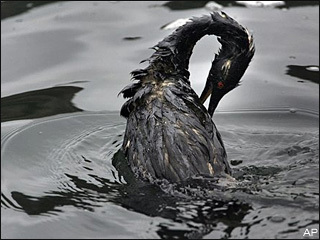 In the wake of the BP oil spill in the Gulf of Mexico and the 2010 Enbridge pipeline rupture that affected the Kalamazoo River in Michigan, however, Howard said it was no surprise to find the Keystone XL project in the cross-hairs. Despite industry assurances — and efforts by members of the Alberta government to intercede by meeting with their American counterparts — opposition to the project drew a range of activists to Washington, D.C. last month for a two-week protest during which about 1,250 people were arrested, including actresses Daryl Hannah, Margot Kidder and Tantoo Cardinal. Hudema called the Washington action an inspiration for his and other organizations — including the Sierra Club, the Council of Canadians, the Polaris Institute and the Indigenous Environmental Network — which hope more than 100 people will meet in front of the House of Commons on Monday and then move in groups into the building, where they anticipate arrest. Hudema said he expects protesters will arrive from across Canada, including from Alberta. Business observers aren’t so sure the protests will capture public imagination to the point where approval for the Keystone XL project stumbles, however — even in light of mass arrests. “When they put their mind to it they can really put on a good show of force and make a strong statement,” said David MacLean, vice-president of the Alberta Enterprise Group. Since 2008, MacLean’s Edmonton-based umbrella group has taken a cross-section of business leaders and politicians to Washington to talk about and defend the oilsands. “The debate is so many levels,” MacLean said, including the need for oilsands companies to improve their environmental records. But also, he said, there is a public-relations battleground. And the province’s role in the fight has not gone unnoticed by members of industry or the protesters taking on bitumen extraction, its carbon footprint, tailings ponds and pipelines. Where business people applaud the efforts of ministers and provincial politicians to tell Alberta’s oil story in the United States and abroad, activists like Hudema accuse the government of having become a “mouthpiece” for the oilsands. “I think industry has asked the government to make sure that we represent what’s true in Alberta and what we represent when we go to America is the Alberta story, which isn’t so much in defence of industry,” International and Intergovernmental Relations Minister Iris Evans said. Since January, her department and the premier’s office have spent about $92,500 on missions to the U.S. to discuss Alberta-produced energy and build relationships. Evans is hoping the next premier — to be selected by Progressive Conservatives on Oct. 1 — will visit Washington later this fall as Keystone XL hearings continue, to gauge impacts on residents along the proposed pipeline route. “I guess you could characterize (protests) as certainly distractions on that front, but I don’t want to belittle their intent,” Evans said. Sep 26 2011 – 9:58am. “It’s been an interesting year, and yeah, it’s been challenging,” said Shawn Howard, a spokesman for TransCanada, the Calgary-based company building the pipeline.” And the stinking money that will kill so.much. must be pretty challenging to not get if the deal blows up. They are all probably buying up stock in pesticide companies for when the migrating birds no longer migrate in the tarsands area, and we are all left with an insect infestation of a Biblical nature. Hurray for the people of Canada with more people than US, protesting. We are so pathetic. We let a mere thousand do our protesting for us. Shameful. .
Sep 26 2011 – 12:46pm. Canadian Naomi Klein protested in front of the White House in Washington, D.C. along with a number of indigenous Canadians. As Naomi Klein told it, she didn’t intend to get arrested, since she was concerned the United States might refuse to allow her to enter the country again, if she were arrested. But when Naomi Klein saw that the indigenous Canadans had no intention of moving when told to do so by the police, she decided to get arrested with them. I wonder if there are any citizens of the United States who are risking arrest in Ottawa, Canada, today. See “Author Naomi Klein arrested in oil sands protest September 3, 2011”. .
Sep 26 2011 – 1:11pm. Given the highly remote likelihood of such protests having any real impact on those who actually make the decisions and policies (hint: not “the people’s representatives”) Americans are conserving their energies for the forthcoming Second American Revolution. Fat chance! Unfortunately, although any such “peasants revolt” like its precedants might possibly re-position a few of the current imperial powers somewhat, it’s equally unlikely to end imperial tyranny. .
Sep 26 2011 – 12:06pm. Good for the Canadians to be protesting in mass numbers. If this tar sands stuff is as bad as it seems, shutting it down is the only way to go. If it were as good as the promoters say, then why aren’t they building a refinery in Canada? What kind of sense does it make to send it to Texas? The environment is a loser no matter what if it isn’t stopped. .
Sep 26 2011 – 12:48pm. This protest action is very significant. One can only hope that the public at large pays attention and the Canadian media cover the protest appropriately and not try to ignore it or misrepresent it, cleverly portraying the protesters as some kind of tree-hugging nuts. That is a real challenge – to get this point across. I can imagine a lot of people in Alberta (Canada's Texas) getting furious about this protest, as it not only impacts on their present livelihood, way of life and recent prosperity, it could even provoke strong feelings of entitlement and the urge to tell "outsiders" to just f*ck off. Sep 26 2011 – 1:14pm. Raw bitumen is thicker than molasses in January. Fuel from this type of production is extremely expensive and dirty. Fuel must be used to create the amount of pressure needed to pump raw bitumen. Fuel is consumed to refine the raw bitumen to oil. When the resulting oil is finally burned, it adds yet MORE carbon to the atmosphere. "bitumen extraction, its carbon footprint, tailings ponds and pipelines" degrade the planet. All this without even considering possible environmental damage caused by a leak or spill. Other reasons that Canadians are ticked off: – the Prime Minister is from Alberta with longstanding support for the Alberta oil industry. – the Prime Minister & his government cut financial incentives for the development and production of renewable fuel sources in order to support tarsands production. – the Prime Minister is afraid of the Green Party of Canada. Along with the support of media, the government dinosaurs and backward thinkers prevented participation by the Green Party in election debates. Thanks to the very hard work of Canadians who support Green Party Policies, there is now an MP from the Green Party. Elizabeth May, leader of the Green Party of Canada, former president of the Sierra Club, is now being heard in the Houses of Parliament in Ottawa. Elizabeth May knows more about tarsands, from her first-hand experience, than any other Member of Parliament. Look for her on Monday. .
Sep 26 2011 – 2:10pm. The arrests have already started. Protestors are calmly, peacefully climbing over a Police erected barricade (which is blocking access to public property), and sitting quietly on the grass. While the cameras are on them, the Police are interviewing the protestors, then arresting them and leading them away. But the Ottawa Police are quite well known for acts of shocking criminal brutality when the cameras are off or not present. Look for this to get ugly. Free speech is dead, dead, dead. In Canada, the US, and all over the world. Posted by rogerhollander in Barack Obama, Energy, Environment. Roger’s note: When will they ever learn? The strategy of not offending Obama is a dead-end. Obama has long shown his true colors as a hypocrite and dissembler; basically a fraud played on well-meaning youth and liberals. It is one thing to be loyal, another to be hopelessly naive. Obama is the enemy. Just because he is nowhere as loony as a Perry or a Bachman doesn’t mean that he needs to be coddled. 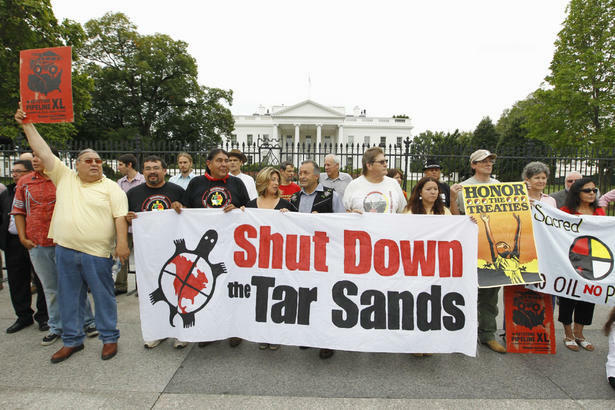 Demonstrators, including Canadian activist Naomi Klein (fouth from left), hold up signs in front of the White House in Washington, Friday, Sept. 2, 2011, to protest the Keystone XL Pipeline project in the US, and the Tar Sands Development in Alberta Canada. WASHINGTON—More than 1,000 people have been busted at the gates of the White House the past two weeks, as the most ambitious of climate protests against Canadian oil comes to a head. Toronto author and activist Naomi Klein was not planning to be among them. Support the cause? Sure. Speak to the anti-tarsands faithful? Absolutely. But to actually get arrested? No, Klein and the other Canadian protesters in Washington agreed — that is a stand best left to their U.S. counterparts, who need not worry whether such close encounters with law enforcement will hamper their ability to cross borders in the future. Yet there was Klein on Friday, being led away by police in the latest harvest of detainees after a last-second decision to put her liberty on the line in opposition to the controversial Keystone XL pipeline. “I wasn’t planning to get arrested,” Klein told the Star minutes after she was sprung. “It was a last-minute decision. I was sitting there with several indigenous leaders from Canada. And when it became clear they intended to stay where they were and expose themselves to arrest, well . . .” She did the same. For Klein, it was a first-ever arrest. “I write. And I’m an activist. But I’m not a chanter, not a marcher. I’ve never been arrested before. Klein is unsure yet whether the bust will come back haunt her in future cross-border travels. For now, her speedy release means she will be free to fulfill plans to address Saturday’s campaign-ending protest in Lafayette Park opposite the White House. The overarching question in D.C., however, is whether the cause is already lost. Though no final decision on the $7 billion TransCanada pipeline is expected for 90 days, all the body language emanating from the Obama administration suggests minds are made up and the project to nearly double the American intact of carbon-intensive Alberta bitumen is a go. Last week the U.S. State Department gave the strongest endorsement yet of the plan to build the metre-wide steel straw from Alberta to Texas in its final environmental assessment. U.S. Energy Secretary Steve Chu, in a subsequent interview, framed the issue as “not perfect, but it’s a trade-off. “It’s certainly true that having Canada as a supplier for our oil is much more comforting than to have other countries supply our oil,” Chu said. Many longtime interpreters of Washington’s political tea leaves suggest the final political considerations for Keystone XL come down to jobs. A $7 billion, shovel-ready project here and now, for a President whose future likely depends on how Americans are working in November, 2012, when Obama comes up for re-election. The political risks for Obama are vast, insofar as many of those arrested these past two weeks are among his truest believers — the young, grassroots activists who help lift him to power in 2008, fully expecting an administration that would follow through on its promise to wean the country off fossil fuels. One of them, Courtney Hight, acknowledged her discomfort in an interview with the Star. The Floridian activist was “one of the first boots on the ground for Obama,” dedicated three years of her life as his campaign’s Youth Vote Director. She went on to join the White House Council on Environmental Quality before shifting back to activism as co-director of the Energy Action Coalition. She was arrested Thursday, outside the front door of the President she thought agreed with her. “It feels inherently weird and uncomfortable for me to do something remotely critical of this president,” Hight told the Star after her release. “But I feel ownership over his current position. I am disappointed he is not being stronger, although it is understandable given the continuing attacks he is facing,” said Hight. The protests against Keystone XL, says Klein, are simply one facet of a broader, multi-pronged campaign targeting the industry through multiple pressure points, from consumer campaigns to boycotts to agitating individual corporations to commit to avoiding tarsands oil. “Powerful movements are built on strategy, not saviours. So if it turns out that Obama approves this pipeline, the movement is not going to crawl away, it’s going to change strategy,” she said.